South Bend, Indiana May 22, 2018 - Just in time for spring rains across North America, TayMac has you covered with the MX7200 Jumbo RaynGuard® Cover. The metallic weatherproof outlet cover provides extra room for outdoor cords and plugs. TayMac, part of Hubbell Commercial Construction, provides innovative electrical products to industrial, commercial and residential markets. 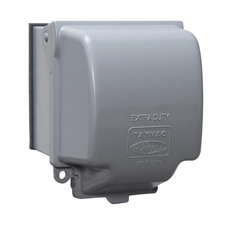 TayMac's MX7200 is a 2-gang die-cast aluminum In-Use cover. It offers an extra roomy 5-1/8in deep space for outdoor cords and plugs. Included adapters provide 55-in-1 configuration possibilities for GFCI outlets, duplex outlets, switches, round devices and more. Features of the MX7200 include a hasp for full size padlock (up to a 1/4in shackle), a cord catch and rain chamber for splash protection. This model also features TayMac's patented Quick-Fit keyhole mounting system, which allows the cover to be installed in under one minute. The MX7200 meets or exceeds Extra-Duty requirements for in-use weatherproof outdoor covers. It is NEMA 3R and NEC compliant. TayMac's Jumbo cover features a premium powder coat Gray finish. It includes a gasket and all mounting hardware. The TayMac MX7200 Jumbo RaynGuardMetallic Cover is available now. Find more information at www.hubbell.com. Follow the brand on LinkedIn and Twitter. These historic brands are part of Hubbell Incorporated, one of the largest electrical manufacturers in North America. The company's history of innovation extends back to 1888. Founder Harvey Hubbell invented the pull chain light switch and electric plug.